Paul Pogba, who is the leading goalscorer for Manchester United in the Premier League at the moment, considered leaving the club as he was not happy under former manager Jose Mourinho, Mathias Pogba, who is the elder brother of the World Cup-winning midfielder has revealed appearing on Telefoot. He also mentioned that he is much happier now and is relishing the responsibilities given to him by current manager Ole Gunnar Solskjaer. Pogba had been linked with a move back to Italy with Serie A giants Juventus this entire season, given his multiple fall-outs with Mourinho. He was also linked heavily with Barcelona, but they landed Ajax starlet Frenkie de Jong last month instead. Pogba won the Golden Boy award in 2013 in his first season with the Old Lady after impressing one and all with his skills and long-range shooting skills in Italy as a 19-year-old. 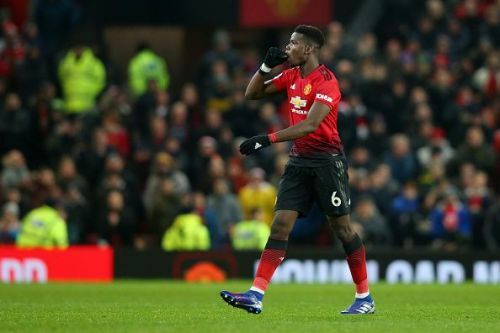 Manchester United are on an unbeaten run under new manager Solskjaer and Pogba has been an integral part of his squad and has finally found his rhythm under the Norwegian. The 25-year-old Frenchman has been directly involved in 11 goals (6 goals and 5 assists) since Solskjaer took over at the Old Trafford from Mourinho. Mathias Pogba was talking to Telefoot and commented on his brother's return to form while revealing that he almost left the club because of the unhealthy relationship with the Portuguese. Things were not going well under Mourinho. Now that Solskjaer has given him the keys to the team, so to speak, things have started up again. That's what my little brother needs. He was under contract, and above all he had to just keep quiet, grit his teeth, and keep working. When you give my little brother that responsibility, you will only see the best of him. The Red Devils are now only two points away from securing a top-four spot. So all of their attention now must be on their UEFA Champions League clash with PSG next week.